Campbell Scientific’s WP100 is a turn-key data acquisition system for the wind prospecting industry. 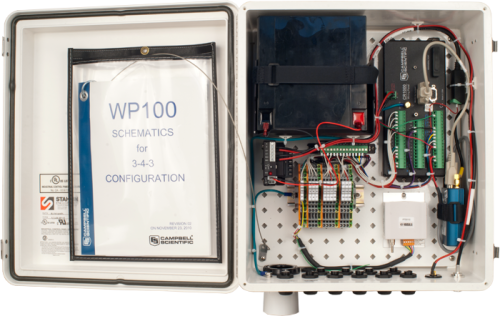 Designed for rapid installation, the WP100 can be quickly reconfigured using varying sensor configurations. This system supports a wide range of uses and is an ideal drop-in replacement for existing data logger enclosures in both temporary and permanent met tower applications. Upgrading to a WP100 takes full advantage of your wind resource assessment dollar, whether you are using your current sensor configuration or adding sensors to expand your system’s capabilities. The basic WP100 consists of a CR1000 datalogger, a BP24 24-Ahr rechargeable battery, a CH100 regulator, LLAC4 interface, a cellular modem, a barometer, and a terminal strip. Sensors from existing systems are connected to the WP100. Typically six anemometers measure wind speed; two vanes measure wind direction, two thermistors measure air temperature, and a barometer measures barometric pressure. 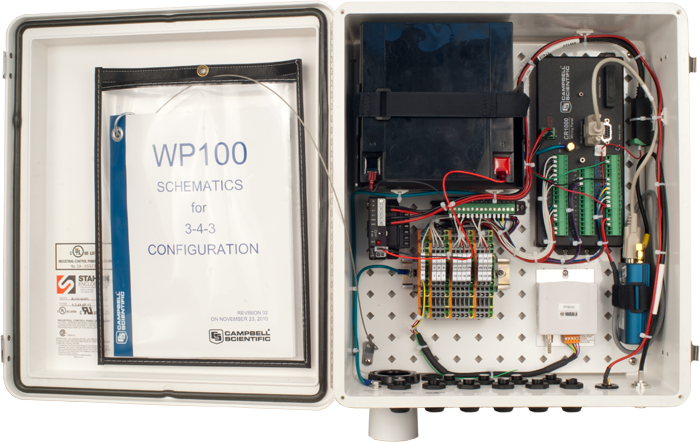 The WP100’s data logger is factory configured, programmed, and tested prior to shipment to your site—minimizing potential field wiring errors and deployment time. Real-time or interval data are stored locally on the data logger, and can be collected via Modbus, DNP3, LoggerNet, or other standard communication protocols over a cellular link. RS-485, fiber optic, TCP/IP, and satellite communications are also supported. Campbell Scientific data acquisition systems are manufactured in the USA and used worldwide in the wind industry. The WP100’s components are known for their versatility, precision, and dependability—even in harsh, remote environments—minimizing measurement uncertainty. -NOTE- For specifications, refer to the CR1000 Measurement and Control Datalogger.